The rosters for the annual Shriners Classic were recently released by the Massachusetts High School Football Coaches Association and nine Hockomock League football players were selected to compete in this year’s game at Bentley University on Saturday, June 17 at 4:00. The nine players, all seniors representing seven Hockomock schools, who will be part of the South team roster are Joe Bartucca of Foxboro, Riley Burns of Milford, John DeLuca and Carl Sanuth of King Philip, A.J. Gibbs of Mansfield, Adam McLaughlin of Taunton, Bobby Mylod and Thomas Reynolds of North Attleboro, and Ryan Sullivan of Stoughton. The annual all-star game pits graduating high school seniors from teams in the North and the South and raises money for the Shriners Hospital in Boston. Through the years, the MHSFCA has partnered with the Aleppo Shriners and has donated more than $1 million through its all-star game. The players were nominated by their coaches and then selected by the coaching staffs that were elected by the MHSFCA to run the game. The South team will be coached by Bill Kinsherf of Archbishop Williams. In addition to being part of the Shriners Game, Burns, DeLuca, and Mylod were also chosen by the MHSFCA as part of the annual All-State Super 26 Team. Also, North Attleboro assistant coach Jack Johnson will be honored at the annual banquet as one of six MHSFCA Assistant Coaches of the Year. 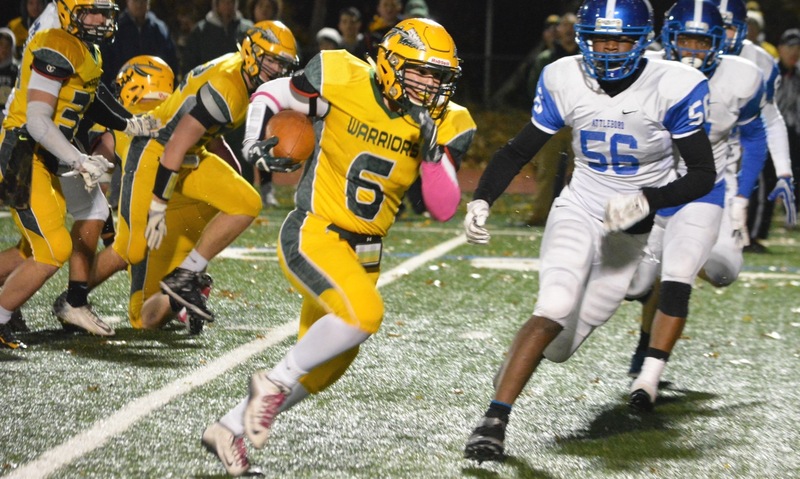 Each of the nine players were Hockomock League all-stars this fall. 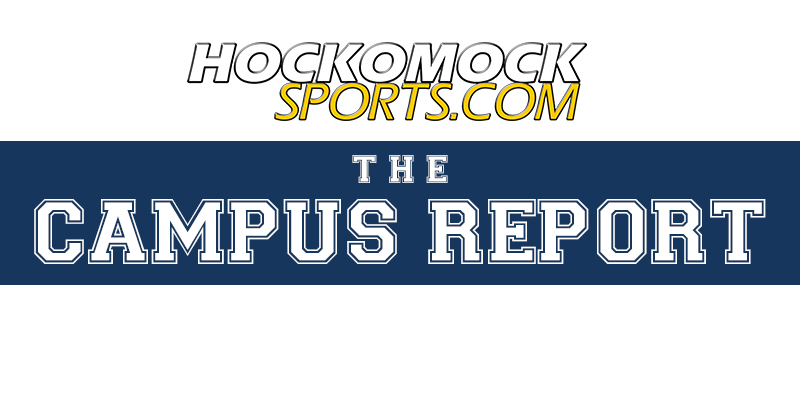 DeLuca was named both the league MVP as selected by the coaches and the HockomockSports.com Player of the Year. The Shriners Classic will be held on June 17. For more information, visit http://shrinersclassicsports.com. TAUNTON, Mass. – It was a play Taunton’s Adam McLaughlin has practiced over and over again this year. With the Taunton Tigers holding a 12-7 lead and Oliver Ames using its longest drive of the game to near the end zone in the fourth quarter, the senior defensive back watched as Oliver Ames dropped back to pass on first down. As the throw came out, McLaughlin didn’t hesitate and jumped the route, stepping in front of the receiver for an interception at his own 8 yard line. Taunton went on to score six plays later and added an insurance score in the final minute to pick up a 25-7 win, snapping an 18 game division winless streak and registering the team’s first Hockomock League win since November 2012. And after he caught it? “Run as fast I could and get down the field, it was a great feeling,” McLaughlin said with a big smile. McLaughlin brought the ball back to Taunton’s 45 yard line. Back to back runs from Brevan Walker (18 carries, 122 yards) and then a 16 yard rush from TJ Mendes gave Taunton a pair of first downs. After OA limited Taunton to just a yard on its next to plays, Taunton faced a 3rd and 9 from the OA 28 yard line. The Tigers used play action with sophomore quarterback Noah Leonard (7/10, 87 yards, two touchdowns; five carries, 31 yards) rolling to his right. He then fired, hitting a wide open Mike Fernandez in the end zone for 28 yard touchdown and an 18-7 lead for Taunton with 3:33 to play. It was McLaughlin that opened the scoring in the game on the aforementioned play by Sidwell. After OA was forced to punt on its first drive, Taunton marched down the field on seven plays, covering 81 yards. A pass interference call kept the drive alive early on and Walker had runs of 19, six and 16 yards to help the Tigers move down field. On first and 10 from the 19 yard line, Leonard floated one to the corner of the end zone where McLaughlin was able to leap up and haul in the touchdown to make it 6-0. Oliver Ames had its next drive ended when Sam Krajewski picked off a halfback pass on the first play of the second quarter. 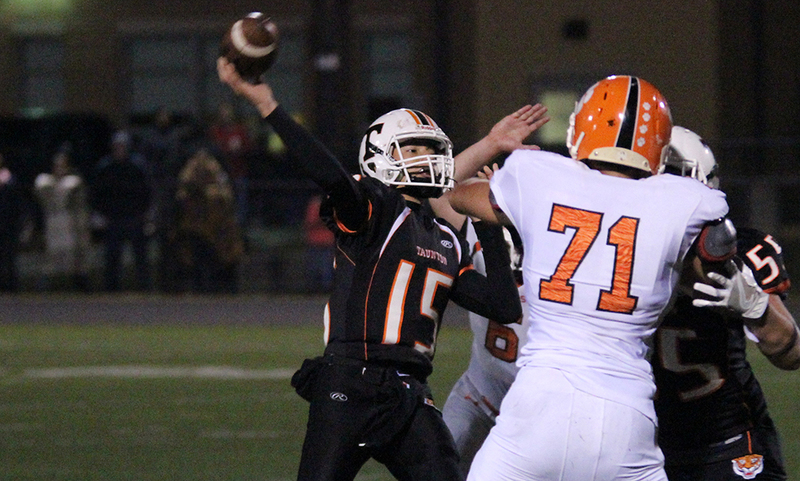 OA’s defense did its part though, forcing a punt from the hosts on a three and out. Kyle Gagliardi led OA on its most successful drive of the game, covering 43 yards on 10 plays before finding the end zone. The combination of running backs Liston Funai (17 carries, 94 yards) and Anthony Berksza (five carries, 37 yards) proved to be tough to stop on the drive. Gagliardi hit Brandon Timulty on a fourth down to keep the drive alive and two plays later, connected with Berksza on a screen for a 15 yard score. Leandro Moro’s‘s extra point gave Oliver Ames a 7-6 lead at the break. Taunton had an ideal first drive of the second half, retaking the lead just three plays into the stanza. Walker was able to find some space on second down and then made a pair of nice moves downfield and raced for a 66 yard touchdown. OA stopped Taunton short on the two-point attempt but Taunton held a 12-7 advantage with 9:21 left in the third quarter. Oliver Ames next drive ended in a punt but the defense held Taunton at bay, forcing an incomplete pass on fourth down. That led to Oliver Ames’ 10-play, 48 yard drive that was ended by McLaughlin’s interception with five minutes to play. After Fernandez’s touchdown, Taunton’s Billy DaRosa recovered a fumble on the ensuing kickoff. On third down, Mendes (four carries, 39 yards) broke free for a 21 yard touchdown with less than a minute to play to ice the game. After Taunton nearly upset Mansfield a week ago – a two point loss – Sidwell knew the program was headed in the right direction. Taunton football improves to 2-4 overall and 1-3 in Kelley-Rex play. The Tigers will try to make it two in a row when they travel to Macktaz Field to take on the Kelley-Rex champs, King Philip. Oliver Ames (2-4, 1-3) will try to bounce back when they host Mansfield next week. ATTLEBORO, Mass. – Last year, then sophomore Cam Furtado made an instant impact when he took over the starting quarterback position. 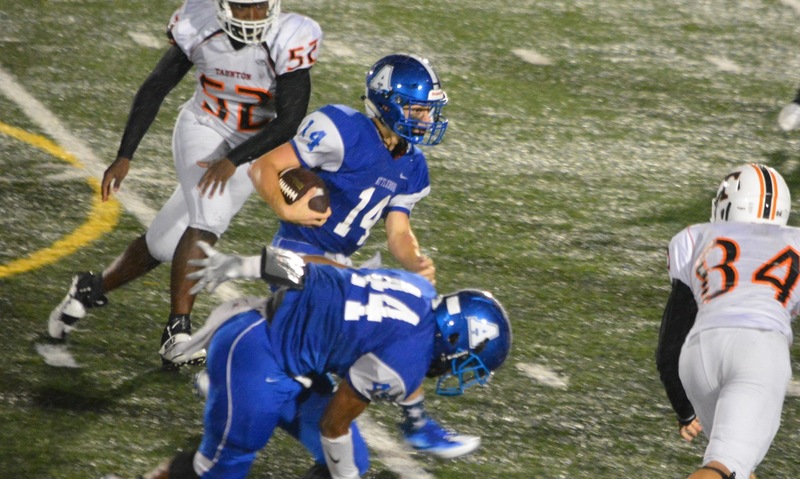 His ability to make plays with his feet gave Attleboro’s offense a different dynamic. With senior Tyler McGovern back as the starter this season, Furtado is being used in a variety of ways, but regardless of which position he lines up at the Bombardiers are trying to get the ball in his hands. On Friday night, in the wind and rain at Tozier-Cassidy Field, Furtado carried the ball 17 times for 209 yards (148 in the first half alone), caught two passes for 17 yards, returned a punt for 40 yards, and scored a pair of touchdowns. Behind Furtado’s all-around game, the Attleboro offense clicked into gear and the Bombardiers earned a 37-20 victory over Taunton to record their first league win of the season. “I think they complement each other,” said Attleboro coach Mike Strachan of McGovern and Furtado. “We’re starting to get into a rhythm with two quarterbacks, but [Cam’s] a special athlete and he can do a lot. Taunton running back T.J. Mendes (25 carries, 67 yards) was stopped on fourth and one by Andrew Gingras and sophomore Nick Evans. Attleboro took advantage of the big defensive stand. Furtado broke a 44-yard sweep down the near sideline, but stepped out at the two. One play later, he had his first touchdown and the Bombardiers had the lead. The Tigers responded right away, marching 63 yards on nine plays to tie the game. The drive was helped by an Attleboro pass interference call, but was finished when sophomore Noah Leonard hit Adam McLaughlin for a 17-yard touchdown on the first play of the second quarter. Lining up at quarterback, Furtado took the first play of Attleboro’s next drive for 12 yards. The following play went for 51 all the way down to the Taunton 10. On first and goal, Marc Dieu broke an inside hand-off to the left and scored to regain the lead. Again the Tigers responded and again it was the combination of Leonard and McLaughlin that got Taunton on the scoreboard. Leonard threw a perfect strike over the defensive back to the sideline and McLaughlin pulled it in, stayed in bounds and raced for a 70-yard touchdown to cut the lead to one score heading into halftime. The game changed on the opening kickoff of the second half. The ball was dropped by the Tigers and Joshua Therrien came up with the recovery for the Bombardiers at the Taunton 28. Three plays later, McGovern walked in with an 11-yard keeper to build the lead to 28-14. The Attleboro defense continued to make big plays, stopping Taunton twice on fourth down. Steve Hamerski, Matthew Potter, James Weir, and Evans all making plays to bottle up the Tigers offense. Again special teams came back to haunt Taunton, as a holding call took away a decent punt and when the Tigers lined up to kick it again the snap flew out the back of the end zone for a safety. Mendes scored a two-yard touchdown to cap off a drive that was highlighted by Leonard hitting Mike Fernandez for 26 yards down the seam. The two-point conversion was incomplete and the Tigers trailed 30-20 with 4:32 left. Furtado essentially ended the game after the onside kick bounced out of play. He bounced to the outside on a toss right and seemed to cross the goal line but was marked down at the one. McGovern (5-11, 37 yards) finished it with a play action pass to Hamerski. Both coaches threw a number of underclassmen on the field, many of whom are spending their first seasons on varsity. While both Strachan and Sidwell admitted their were mistakes that need to be ironed out, both also recognized that the programs are in good positions to build for the future. Attleboro (2-2, 1-1) will travel to Muscato Stadium to face Oliver Ames next week. Taunton (1-3, 0-2) will host Mansfield at Aleixo Stadium.